List of baby hat knitting pattern ideas from the Internet. 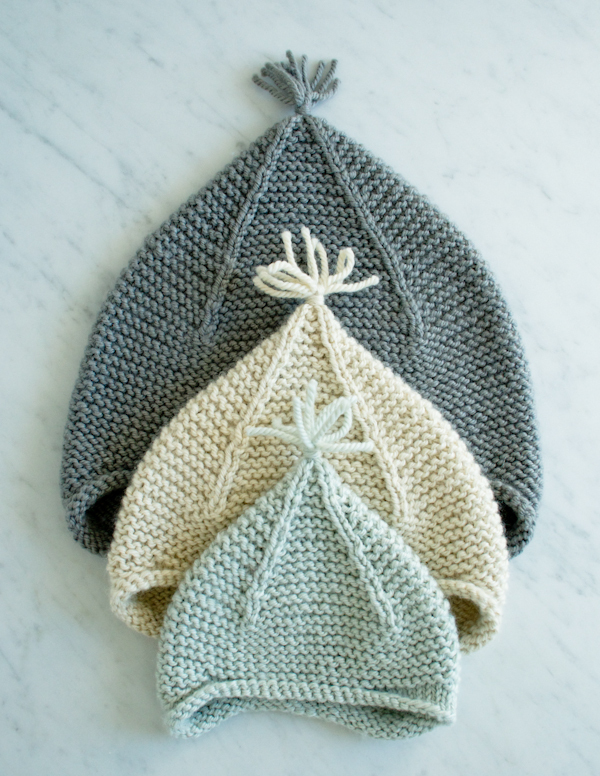 A baby hat or beanie is a quick knit. What makes them fun are the cute themes they are designed in. Most of them are knitted in the round but they can also be knitted flat and then seamed. My selection starts with basic shapes and borders before moving on to cuter designs inspired by all sorts of things around us. 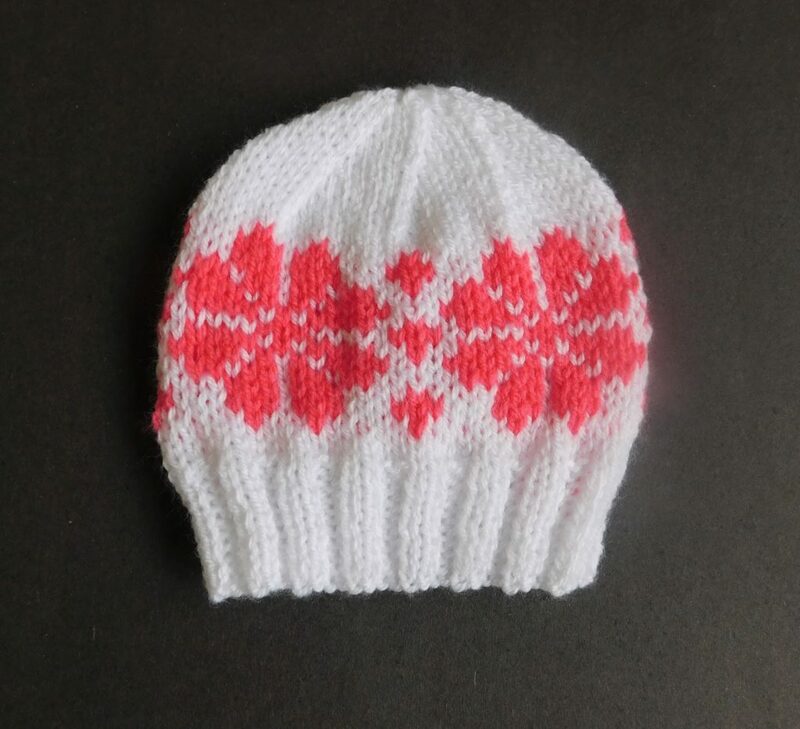 A good basic baby hat knit pattern to learn from. It starts off with a 2-stitch ribbing and continues in stockinette stitch. 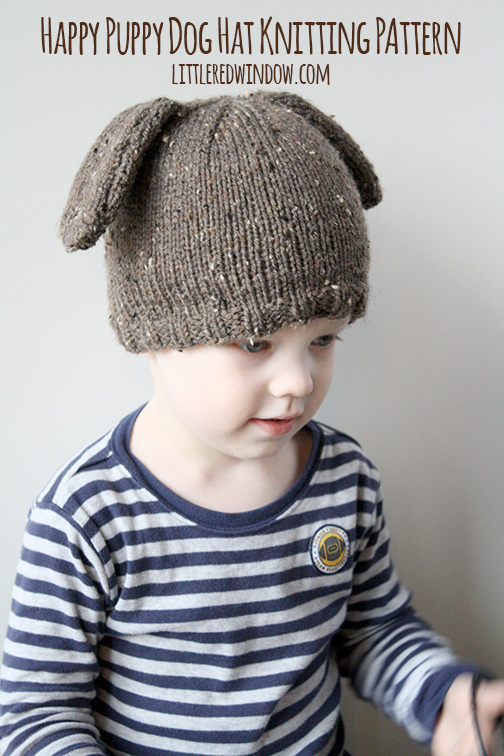 Use double-pointed needles, magic loop or 2 circular needles to make this hat. A variegated yarn would make the hat more interesting than a plain solid colour. 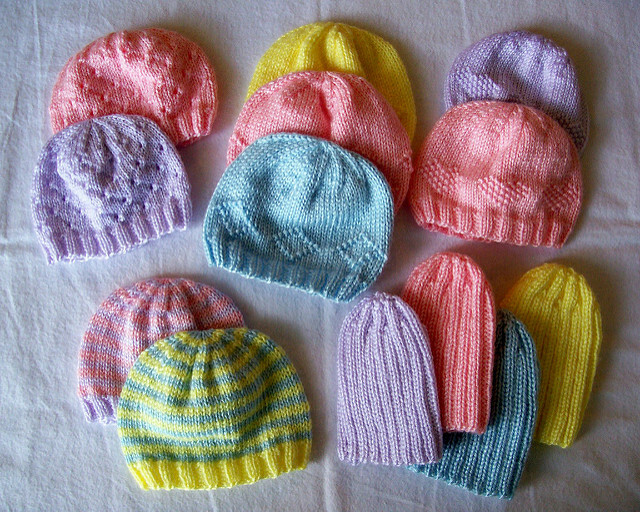 Carissa offers five different versions of preemie hats to knit. Four of them share the same basic shape. Knitted in stockinette stitch featuring stitch patterns like eyelets, hearts, diamonds, and stripes. The fifth one is shaped using ribbing in solid colours. Because of ribbing’s elasticity, it can fit babies of all sizes. 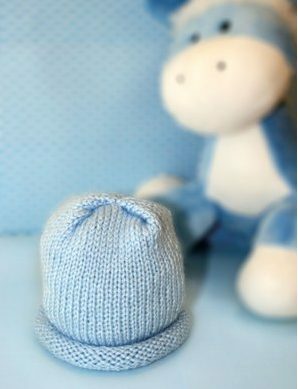 The following knitted baby hat patterns with animal designs are always a great hit with both parents and kids. Here is a couple that I thought are simply adorable. With the appropriately shaped and placed ears, and brown worst weighted yarn, a basic beanie can be transformed into a doggy hat. 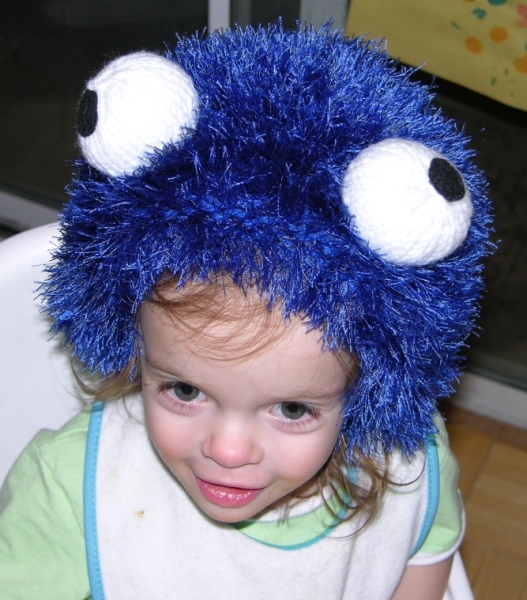 Add a pair of eyes using felt for an even cuter look. 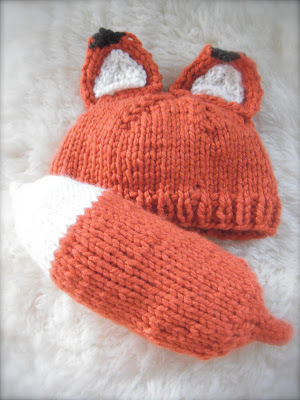 This knitted little fox baby hat comes with a cute tail to complete the costume. Like the doggy hat, this is a basic hat shape with appropriately designed ears and colours. 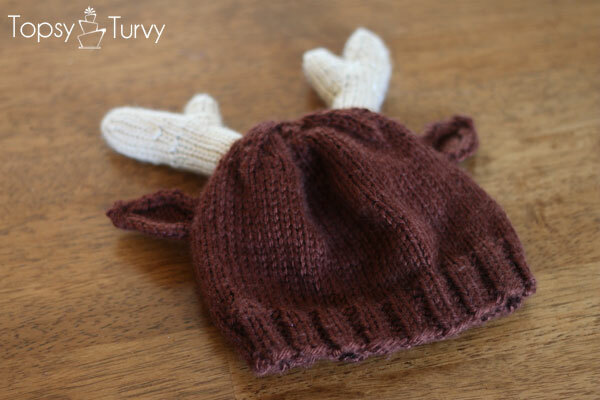 Ashlee Marie did a fantastic job with the reindeer’s antlers on this knit baby hat. It is so cute, I am itching to knit this. Ashlee suggested picking up and knitting the antlers straight from the hat. She gave clear instructions and even have a picture of how to pick up the 12 stitches. I personally would do this just to avoid having to sew them on later. 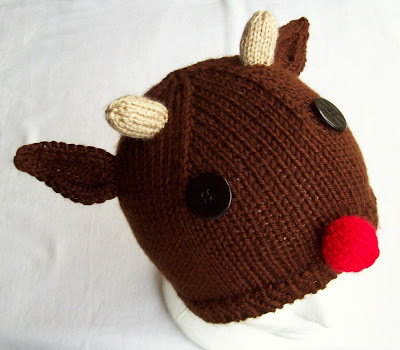 Another reindeer hat and with that little red nose, we all know who this is. I think this baby hat knitting pattern is clearly written. Need to learn a new way to cast on called the tubular cast-on that gives ribbing a nicer edge. With 2 white pom poms as eyes and a stitched red line for a mouth, the froggy outfit is completed with a pair of webbed socks which is included in the set. Need to learn how to do twisted ribbing and using garter stitch on the right side. 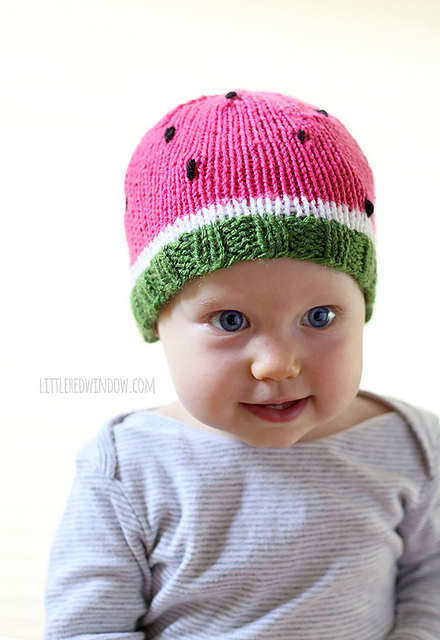 Fruits and vegetables are also common themes for baby hats. Here are some really cute ones. 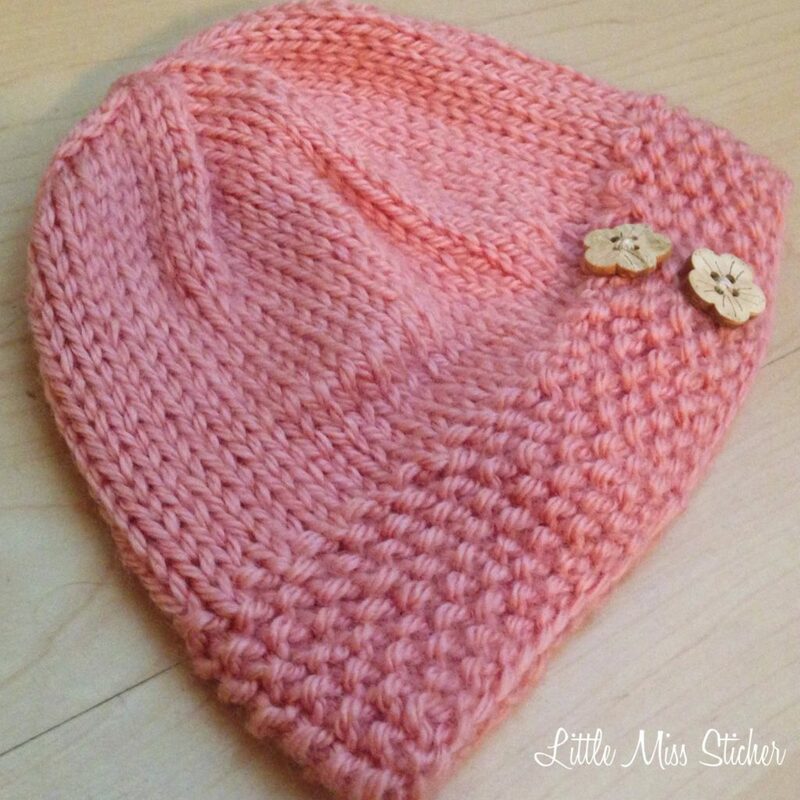 This free baby hat knitting pattern is definitely a beanie for summer. The baby looks delicious. All it took is some clever colour work. Why didn’t I think of that? 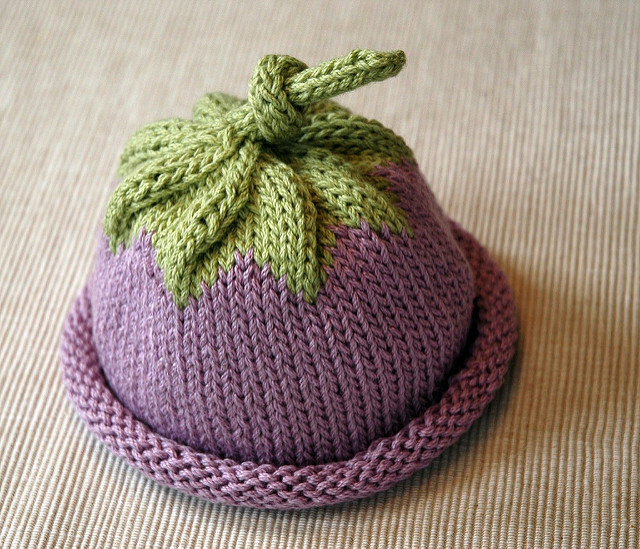 This berry hat is knitted in the round in stockinette stitch. Michele made use of stockinette’s tendency to curl to create the brim. 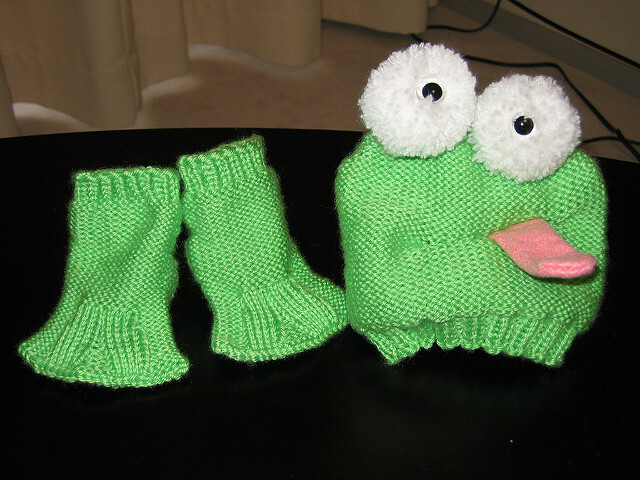 The green stem is incorporated using a stranded colourwork technique. What a good idea. It makes the stem much more realistic. The little knot at the top is a fabulous touch. All these knitted monster hats are great for Halloween hats. Pokemon has become such a hit in so many countries. So have many accessories made to look like poke balls? Here’s one for a Pokemon party. 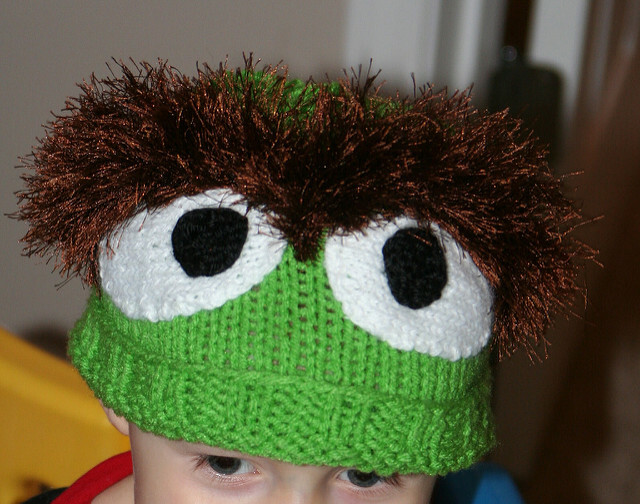 I am very impressed with the likeness of this angry bird hat. 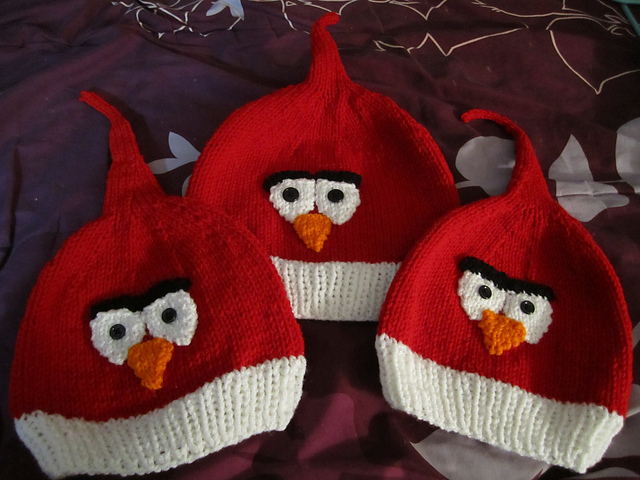 This baby hat knit pattern has a pixie shape and the classic angry bird eyes and beaks. Grouchy Oscar indeed. Oscar’s trademark’s eyebrow is made of faux fur or eyelash yarn. Oscar would be so lonely without Cookie Monster. 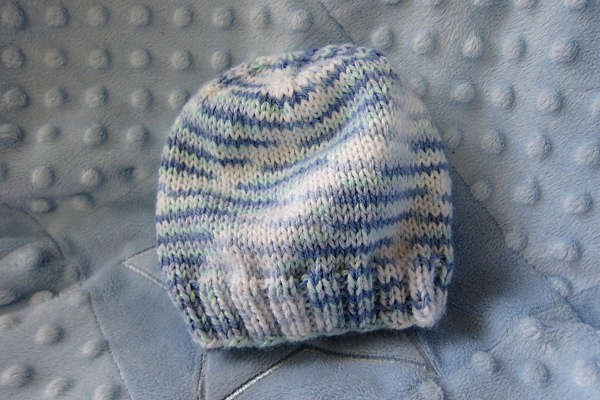 Make both using this knitting pattern of a baby hat. Another way to make the huge eyeballs is using pom poms. Since the release of Despicable Me, so many of us have fallen in love with the minions; their unintelligible speech, love of adventure and bananas. 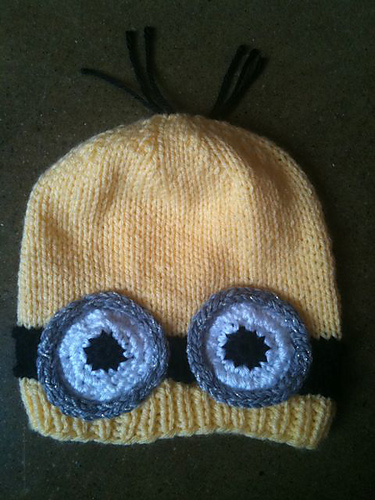 This is again, a basic beanie knitted in yellow with the goggles crocheted and sewn in. Clever shaping creates the shape of this little hat. It requires a little more skill but isn’t too difficult to pick up. And isn’t it cute? Knit them for your little cutie pies. 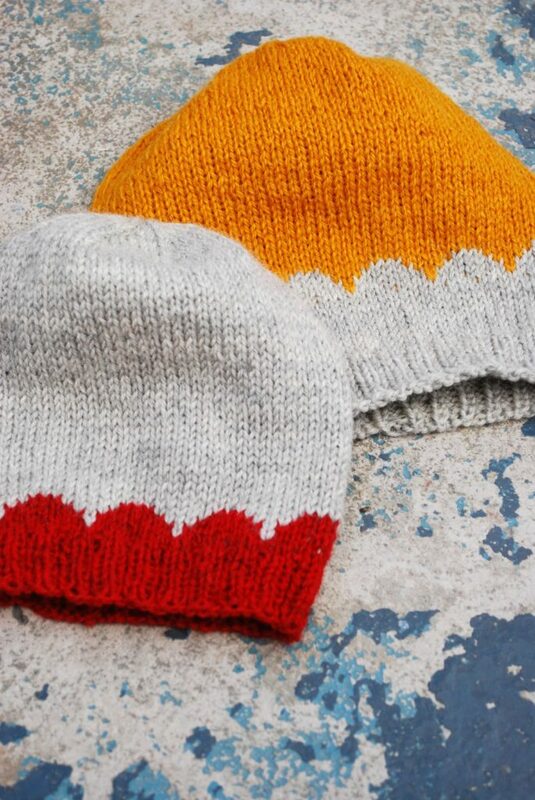 This beanie looks easy but can be challenging for knitters new to fair isle and knitting it in the round. After tackling the fair isle pattern, there are the decreases. But it looks so sweet. Maria’s English pattern is a little sparse but I think it is still manageable. She created a little chart to show how to knit the scallops using 2 different colours. It is not that different from the Berry Baby Hat featured. I like the fact that she combines a mild grey with a bright orange and a bright red colour. The combination gives a nice contrast. Pandas epitomized cuteness. 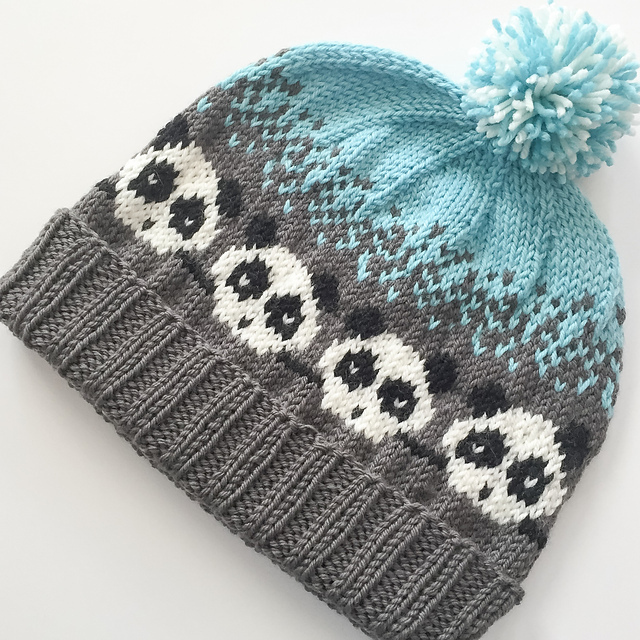 So a cap with a row of panda heads as a pattern means cuteness overload. 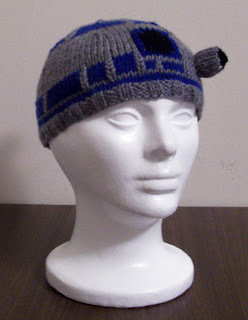 For that Star Wars Fan in my family or friends, knit away. This cute little winter hat is knitted in the round with simple cables. 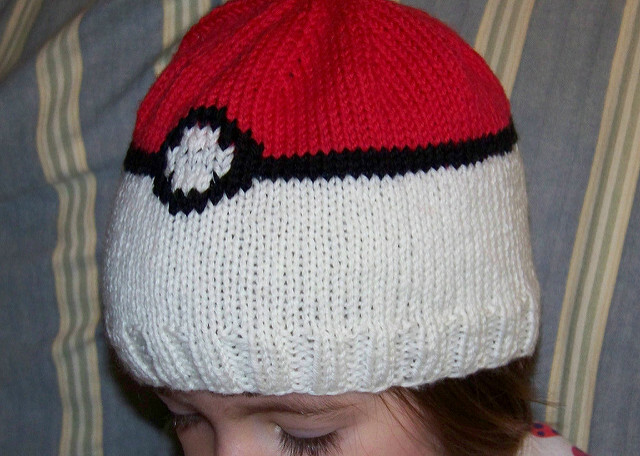 The pattern includes the version with earflaps and another like a beanie. The earflap version is finished with an i-cord string and pompom. Gender neutral, very nice. Laura always produced very good pictures illustrating her pattern. I learned a great deal about stitches and shaping following her patterns and instructions. This earflap pixie hat has a really interesting shape and her choice of yarn makes sure this is a squishy hat. Mostly garter stitch with clear shaping. A really sweet hat. The ear flaps are knitted first and join together using circular needles. 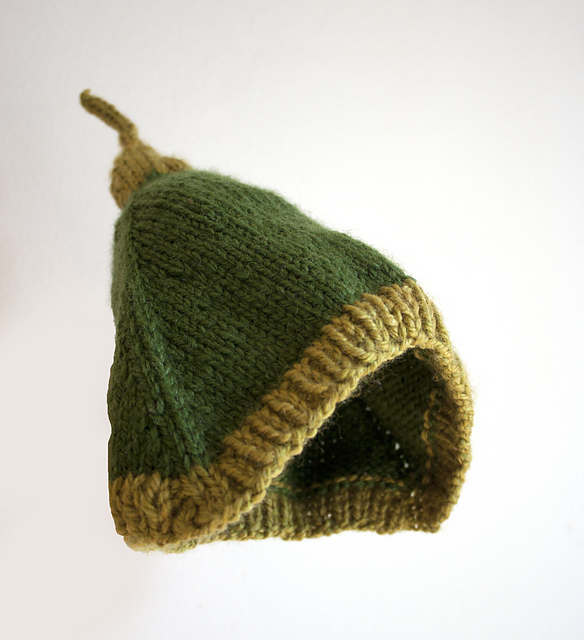 After the ear flaps are connected, the hat is joined in the round and knitted up to the top. Follow the decreases to shape the pointed top. This little hat spots a seed texture band and a stockinette body. The 2 little flower buttons complete the look. Use neutral colours and basic shape buttons to make the hat gender-neutral. This sweet little hat is knitted flat. 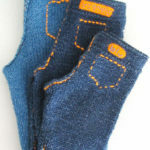 The side seam is sewn together to form the tube. Then, the top seam is knitted close and the 2 corner sewn down in the centre. You can also knit it in the round and only seam the top. If you like this list, you might also like my knitted baby bibs pattern list.